Sarah has the dollars and sense. Travis possesses the horse sense. When tragedy befalls the Bar-M one Christmas, can they put aside their differences to save it? That had been Sarah Mansfield’s goal since grade school. Now, after years of plotting and planning, it lay within reach. She angled the two-carat round-cut solitaire, surrounded by a myriad of smaller stones, to catch the light streaming through the car window. The facets glimmered in the warm, winter sun as it bounced off the bare cypress branches swishing overhead. “Yes. I should have known you’d dare not shop anyplace else.” She gave him a teasing wink. “Only the best for my girl. As soon as I signed the Henderson account with the firm, it proved my worth.” His diamond-eyed, eighteen-carat gold longhorn tie tack blinked in her direction. Symbol of graduating in the top of his Texas law school class. “The ring is perfect. Just like you, honey.” She fluttered her mascara-laden eyelashes and pecked his golf-course-bronzed cheek in response. His French aftershave, at $129.95 an ounce, swept her into euphoria. Yep, all the effort and waiting had paid off. Born into one of the wealthiest horse breeding families in Central Texas, Sarah spent her summers galloping across the plains in the morning, lounging on rafts in the river through the afternoons, and kicking up dust at the rodeo dances until midnight, all the while tantalizing the local boys she kept at arm’s length. While they offered a certain amount of fun, they didn’t fit the bill. Too uncouth and prone to spit chewing tobacco. The school year, spent in San Antonio, sequestered her in an upscale parochial girl’s school away from the inner city sharks, though a few boldly circled the posh pond trying to lure a socialite with their good looks and slumming charms. Nice playthings on which to practice her femininity, but long ago, she’d set her sights on far larger fish—Dallas or Houstonian guys with daddy’s money bulging from wallets in the back pockets of their too-tight jeans. After she graduated, she attended one of the top private colleges in the state and pledged a sorority—the one of her mother and grandmother. Next, she spent the obligatory year touring Europe with the other debutantes, per time-honored protocol, in order to round out her cultural repertoire and to catch the eyes of rich and eligible cosmopolitan bachelors. The fact she had enough brains to make straight A’s all the way through school hardly mattered. Graceful flirtations, the right haircut and perfume, and a flawlessly tanned body did. Her best friend, Emma Rose, landed a minor British duke, but Sarah’s attention fell on Tucker as he volleyed the beach ball while summering on the Italian Riviera. His rippled abs captured the Mediterranean sunbeams and ricocheted into her heart. She used every feminine wile in her well-bred arsenal to convince him to snare her instead of one of the other girls, and then played a mild hard-to-get to reel him in. She convinced her father to pay for her to get her Master’s in Renaissance English Literature at the university in Dallas so she could keep Tucker wiggling on the hook once he landed employment at the prestigious law firm. It was also where she made her debut into society, accumulating well-established names and addresses for her future wedding invitations. “Anything for you, angel. You just keep reminding me you’re worth the wait, okay?” He winked. “Oh, around two-hundred I guess.” She scrunched her nose and swished back her palomino-blonde hair. “Dad insists on letting the ranch hands and their families join in the holiday festivities. Which, unfortunately, means Mr. Righteous will be in attendance.” She mimed a gag, dipping her finger to the back of her tongue. He reared his head back, revealing a protruding Adam’s apple peeking from his starched and professionally pressed Oxford shirt collar. A laugh exploded from his lips. “Good to know.” His eyes returned to the road winding through the prairie grass ahead of them. Julie B Cosgrove has ten contracted novels and novellas published or in the works. She also writes for seven devotional publications and websites and is a professional speaker who leads women’s religious retreats and writers’ workshops. Julie lives in Fort Worth, Texas but her heart is at her family’s property in the Texas Hill Country on the Guadalupe River. Her fiancé cheated on her…in paradise. Broken hearted and confused, Emma flies home to Fort Worth, Texas not sure what life without him will entail. Ryan is being discharged from the Navy to join a gastroenterology private practice in Fort Worth. New city, new life. The last thing on his mind is falling in love. Until a forlorn lady sniffles in the seat beside him on the flight. A storm, an emergency landing and an out of control ex-fiancé thrusts Ryan and Em into a dilemma. Each must make some tough choices, but will those involve each other? The child’s whining persisted as people jabbed and jostled through the claustrophobic cabin. It would be a full flight. My temples began to pulse. I turned to see sandy hair, a chiseled jaw, and piercing blue eyes on the face of a military man. He held his boarding pass in one hand and a khaki duffle bag in the other. It matched his uniform. The Naval emblem on his brass belt buckle glimmered in the late afternoon light as it streamed through the airplane’s portal. Well, this was Hawaii. A bunch of the men onboard wore Navy fatigues. He was being transferred like the rest of them, no doubt. The sailor hoisted his duffle and a briefcase into the compartment above us and shrugged. “No problem. A seat is a seat.” His eyes dropped to scan me. I pulled my skirt over my knees and shifted my gaze to the tarmac beyond the double-paned oval window. He sat down, adjusted his position to dig the seat belt out from the cushion, and then leaned into my space to click it. The insignia on his left collar resembled a gold tree with a green stone in it. On the right, perched a silver maple leaf. Even though my father was in the Naval Reserves most of my early childhood, I never mastered deciphering rank and emblems. I did remember those two meant he was an officer of some sort and, by the khakis he wore, he’d been out to sea. “M? For mystery woman?” The sides of his mouth curled upward. His attention briefly focused on my left hand. It was bare, though it had yet to feel that way to me. I bobbed my head, and as quickly as the sensation came, it left as he released his touch. Something inside me wanted to grab it back. But that would be ridiculous. I didn’t even know the guy. I closed my eyes and shut out the cabin noises. The horrid scene, which caused my decision to board this flight, replayed in my mind. I’d tossed the two carat, blue-diamond solitaire— courtesy of my father’s checkbook so his daughter would wear a decent stone—at Trey’s head as it lay tousled on the bed pillows next to another’s, obviously not mine. She scrambled to the bathroom, wrapped in a bed sheet. He pleaded it had been a one time lapse of judgment. I seriously doubted that. Living in two different cities almost four thousand miles apart had taken its toll. How could I have been so naïve? Above our heads, the seat belt sign dinged off. Airborne. My teeth pinched my lower lip as I observed the island chain disappear amongst the clouds. I always hated good-byes. This one had been final. I’d never be back. The vice grip around my chest crushed my heart some more. Dear God in Heaven, don’t let this naval doctor see me cry. I swallowed the saliva in my mouth in an effort to force the puddles under my eyelids back as well. Had I put on navy liner and mascara that day? Did it streak down my face? I wiped my finger across my under-eye skin then peered at it. No, not very smudged. “Are you, uh, in school?” His eyes narrowed inside his scrunched eyebrows. Julie B Cosgrove is an award-winning novelist, freelance Christian devotional writer and public speaker. When she is not writing novels, she enjoys reading those by other faith-based authors while curled on her sofa with her two purring cats and a cup of Earl Grey. 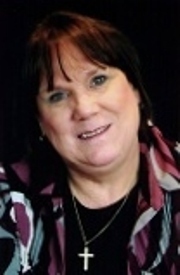 Visit her website www.juliebcosgrove.com and her devotional blog: Where Did You Find God Today? Twin sisters, Erin and Ellen, have envied each other all their lives—so much so they can’t stand to be in the same room and their constant comparisons teeter them both on the brink of divorce. When their mother passes away, her bizarre last request shoves them and their husbands into an unusual situation—spend fourteen days together in her home preparing it for auction or lose all their inheritance. Can they do it, and will their marriages survive the ordeal? Church bells tolled their arrival. Already a stream of cars dotted the parking spaces like soldiers lined for battle. For Erin Ballinger Duncan it seemed appropriate. Today she’d combat an overwhelming struggle of the heart. Well, perhaps it could involve skirmish for territory as well— in a strange sort of way. But she tried not to think about that right now. “Stop, okay?” John leaned into her ear with a hiss. “Can’t you two get along for three hours? For your Mom’s sake, and mine by the way.” A residual hurt sounded in his voice. Once again she’d compared him to her sister’s spouse. Erin bit her lip and turned away. Her twin sister, Ellen sauntered towards them in her black linen three-piece ensemble, which probably cost more than Erin’s monthly grocery bill. Not to mention the black and white pearl earrings and necklace set against her country club tanned skin, or her perfectly curled coiffure. Erin ran a hand over her own short curls, still slightly warm from the hotel hairdryer. When did Ellen find the time to book a hairdresser? They only heard news of their mother’s death three days ago. Ellen’s husband, Robert—never called Bob because that would be too gauche and informal—climbed out in what appeared to be a custom tailored suit accented by a designer tie. Their three girls, Brittany, Elena and Jade, slithered out next, all without a crumple in their dresses. Miniatures of their mother. Each carried herself with shoulders back and spine straight as if the pavement to the church was a style show catwalk. Maybe the posh private girl’s school they attended made them strut with rulers on their heads in order to maintain proper balance. Ellen brushed past them with a nod, her brood and hubby in tow like peacocks on parade. Erin stretched her mouth in a terse smile as the sisters made brief eye contact. Then with a slam of the limo door, she gathered her boys around her and nudged them ahead. Friends, acquaintances and distant family silently trudged up the steps to the sanctuary doors. Most dressed in black with heads down or glassy eyes set straight ahead and clenched jaws. Typical funeral protocol. As the families mounted the concrete steps to the church, Erin’s gaze panned her sister’s slim-legged length that ended in a pair of five-inch stilettos, most likely Christian Louboutin. Yep, red soles. How much did that cost? With each stride, Erin pressed her high-heeled sore feet to the pavement to keep from wobbling. How did career women wear these all day? Ballet flats or sneakers were more her style as a stay-at-home mom. A blast of too cold AC and organ music hit her senses as the ushers opened the doors to herd the family down a separate side aisle. To keep the tears from welling again, Erin sucked in a lungful of air and marched straight ahead, chin up—not so much in imitation of her twin as to keep from noticing the sympathetic faces already seated. Her mother always told her daughters to never cry in public. “Ellen. Robert.” John whispered their names and nodded for them and their girls to enter the reserved pew first. They shot him a terse half-smile and proceeded to herd their perfect princesses as John held his two boys at bay with a firm grasp on their jacket collars. John sucked in a deep breath through his nose and let it out in an elongated sigh as he snapped open the pew bulletin. His irritation pierced Erin’s already punctured heart. John, whose best friends were also his brothers, never did understand the strained relationship between her and Ellen. Actually, Erin didn’t either. Twins were supposed to have a special bond. Some even had a secret language they shared. Not her and Ellen. No way. Julie B Cosgrove is an award-winning, multi-published author as well as a Christian freelance devotional writer and public inspirational speaker. You can find links to her writings, fiction and non-fiction, on her website at www.juliebcosgrove.com. Follow her blog at http://WhereDidYouFindGodToday.com. She is also on Facebook at https://www.facebook.com/juliebcosgrove, Twitter-@JulieBCosgrove, LinkedIn and Pinterest. Jen has a new identity and life, until someone discovers her secret. However, that’s not the one which may destroy her one chance of happiness. When she unravels the family scandal within the walls of an English country manor, will she have to reveal the truth she’s hidden for so long as well? Or will she choose to live the lie in order to keep the man she loves? As I peered into the baby’s face, I shared Marisol’s sorrow. She should be holding this child, not me. Had Marisol chosen to give this sweet thing up? Or had she been snatched moments after birth? I didn’t want to know. I ached inside—for this baby, for her mother, and for me. All naive victims tossed in the treacherous waves of deceit generated in the wake of my husband’s ambition and cruelty. The infant’s soft eyes blinked the answer straight into my soul. This little girl needed love, no matter how she came into this world. All babies deserved that much. But, was I the one to give that to her? My little finger stroked her chubby cheek as I cradled her. The scents of baby powder and formula filled my nose. Her shiny eyes twinkled unabashed-trust as they focused upon my face. Some innate motherhood gene awoke from deep inside me. A tingly, warm sensation spread from my chest to my eye ducts. My heart double-knotted with hers. A grin crept across to my cheeks as I gently swayed her in my arms. She seemed so innocent. No one had hurt her yet. No one had stomped on her feelings, or lied to her face, or cheated on her. And now, in this new life the government had given me, I had to pretend that none of that had happened to me either. Maybe, this baby symbolized my fresh start. I’d protect her. Ensure she had a normal, safe life. No one would be the wiser, right? Surely lots of kids grow up in WITSEC protection. But would I be able to keep all the hurt she’d dredged up hidden? What if somehow, someday, she discovered her past…and mine? Could we love each other, then? Oh, how I hated living a lie. One of his thick black eyebrows raised in a tight arch. Novelist, freelance writer and professional speaker, Julie B Cosgrove, writes for several inspirational publications and websites, as well as leading workshops and retreats. Her characters are strong, determined, and face danger head on with a prayer and a deep, cleansing breath. Follow her inspirational blog Where Did You Find God Today or visit her website at www.juliebcosgrove.com.